Exactly 96 years ago today, World War I came to an end. With the signing of the Treaty of Versailles on November 11, 1918, the war was officially over. It culminated on the eleventh hour of the eleventh day of the eleventh month. Veterans Day is meant to embody these sentiments, and rightfully so. Yet, the sad truth is that this country has habitually failed its veterans. Thus, while President Lincoln's words will always be appropriate, the tweet below more accurately encapsulates the current relationship between this country and its veterans. The United States was born out of conflict, and has been at war throughout much of its existence. It has a strong military tradition. Indeed, we should be proud of the selfless individuals who have risked life and limb to perpetuate our privileges and safety. At the same time, we should be ashamed of the way we have repaid their sacrifice. Thus, it's time for this country to be honest about the disgraceful way it treats its veterans. We have no right to call ourselves "the greatest country in the world" when we don't fight for those who fight for us. On any given night, there are 60,000 homeless veterans. To put this into perspective, around 60,000 Americans lost their lives in the Vietnam War. Around 12 percent of the adult homeless population are veterans. The majority are single; live in urban areas; and suffer from mental illness, alcohol and/or substance abuse, or co-occurring disorders. Approximately 9% are between the ages of 18 and 30, and 41% are between the ages of 31 and 50. …America’s homeless veterans have served in World War II, the Korean War, Cold War, Vietnam War, Grenada, Panama, Lebanon, Persian Gulf War, Afghanistan and Iraq (OEF/OIF), and the military’s anti-drug cultivation efforts in South America. A great deal of homeless veterans are Millennials who served in the War on Terror. The United States has spent over four trillion dollars on this conflict. If you're going to spend that amount of money to send young people off to war, then you better be ready to take care of them when they come home. In 2013 alone, 986,000 veterans under the age of 64 reported living in poverty. Correspondingly, millions of veterans are at risk of losing their homes. Accordingly, it is not surprising that so many veterans are already living on the streets. The Department for Veterans Affairs (VA) has committed to ending veteran homelessness by 2015. Yet, given the scale of the problem, this seems quite improbable. The next time you pass by a homeless person on the street, consider the fact that there's a good chance he or she fought for this country. A large part of the reason so many veterans are homeless is due to the physical and mental health problems they've acquired as a consequence of war. Concurrently, due to the economic constraints that veterans face, they often experience severe mental stress when attempting to adjust back to civilian life. Imagine coming home from war and having to deal with the trauma of that experience while also struggling to pay the bills. Around 77 percent of veterans have faced unemployment, and more than one out of four have faced job searches that last over a year. Indeed, economic inequality is a huge factor when it comes to the mental health of veterans. More must be done to ease this burden. Moreover, many vets are physically disabled and cannot work. Likewise, around 730,000 veterans suffer from a range of mental health issues, including post-traumatic stress disorder (PTSD) and major depression. The horrors of war are not easily forgotten. What's more, every single day, 22 veterans take their own lives. That means that every 65 minutes, an individual who has stood up in defense of this country commits suicide. Tragically, military suicides outnumber combat deaths two to one. This is perhaps the most tragic and disheartening statistic surrounding those who have served. Furthermore, the detrimental impact this devastating trend is having on the families of these veterans is often overlooked. Despite the vast number of veterans facing mental health problems, many aren't receiving sufficient treatment. A whopping 70 percent of veterans with mental illness either don't receive mental healthcare whatsoever or receive inadequate treatment. Veterans are literally dying because of delays in diagnosis and treatment at VA hospitals. In a particularly despicable example earlier this year, CNN discovered that 40 veterans died while waiting for appointments at the Phoenix Veterans Affairs Health Care system. The worst part of this was the fact that the VA officials at the Phoenix hospital attempted to cover all of this up, leading to a national scandal. This is simply unacceptable. We can't send people off to war and then abandon them upon their return. 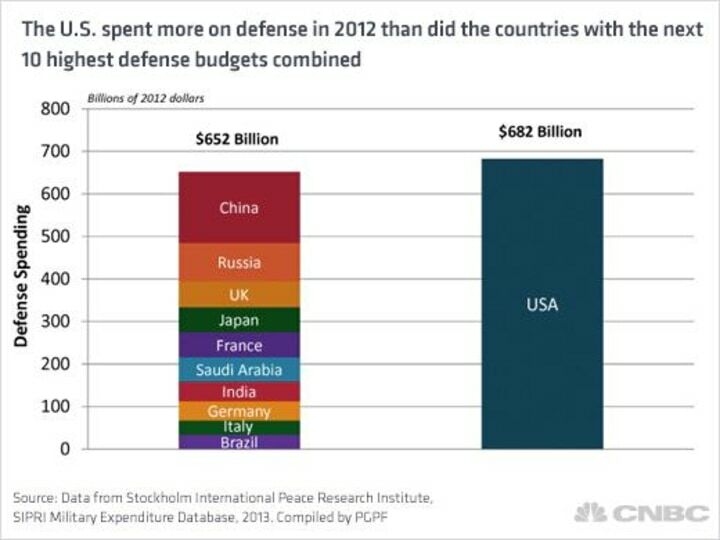 The United States spends more than any other country in the world on defense. Indeed, the US military is exceptionally impressive, and an extremely formidable force. Yet, in spite of all the money this country spends on war, nearly 350,000 veterans of the War on Terror still have outstanding appeals on benefits they are entitled to. These benefits include everything from direct compensation, to pensions, to education. If America is going to spend billions of dollars on the military every year, it goes without saying that a large portion of this money should be allocated to support the nation's veterans. This country is currently failing its veterans. There is so much more that we can do. Firstly, we need to pressure the Department of Veterans Affairs to improve and expand its services. We can do this, in part, by reaching out to politicians and calling on them to continue to address this issue. Likewise, it's important that we provide support to the families of veterans within our communities. Additionally, we can volunteer with various veterans programs, such as TAPS and the Jericho Project, to name a few. Veterans are very often stereotyped into two stock characters: the crying wounded or the guy who jumps the White House fence to get to the president. Don't treat us like victims. We're not broken. We've been through a lot, but we're rising out of it. It's true that veterans face a number of serious challenges, but it would be wrong to assume that they don't possess the grit and optimism to overcome them. After all, many of these individuals have survived combat. If you can live through war, you can accomplish anything. Thus, on this Veterans Day, remember the sacrifice of the countless men and women who have served this country. Simultaneously, work toward spreading awareness of the many ways we can improve our treatment and reception of these courageous individuals. Start the conversation, this is the first step toward change.